In IC engines, the chemical energy contained in the fuel is converted into mechanical power by burning (oxidizing) the fuel inside the combustion chamber of the engine. (a) Hydrocarbons fuels derived from the crude petroleum by proper refining process such as thermal and catalytic cracking method, polymerisation, alkylation, isomerisation, reforming and blending. Flash point is the lowest temperature of a sample at which the fuel vapour starts to ignite when in contact with a flame (ignition source). In IC engines lower heating value is given as the combustion products contain water in vapour form. Heating value of the combustible air-fuel mixture is a decisive factor for engine performance. Viscosity is an important parameter for CI engines, also influences fuel metering orifices since Re is an inverse function of fuel viscosity lower the viscosity, smaller the diameter of the droplets in the spray. Below certain limits, low viscosity increases the leaks in the fuel system. It is a strong function of T – must be given at certain T values at 50 oC, 1.5 – 5.0 Engler or 0.5 to 0.6 centistokes. The precipitation of paraffin crystals in winter can lead to clogged filters. It can be prevented by either removing paraffins from the fuel or adding flow improvers (additives). Antifreezing properties are determined by its filterability. Cetane number is used to specify the ignition quality of diesel fuel. Running on low Cetane number will produce cold start problems. Peak cylinder pressure, combustion noise and HC emissions will increase -more fuel will be injected before ignition, less time for combustion. Higher CN results in a sooner ignition – extremely high CN may ignite before adequate Fuel-Air mixing can take place – higher emissions. Power output can be reduced if burning starts too early. Cetane number is measured by comparing the “ignition delay time” of the sample fuel with a mixture of cetane (C16H34) and alphamethyl naptane (C10H7CH3). 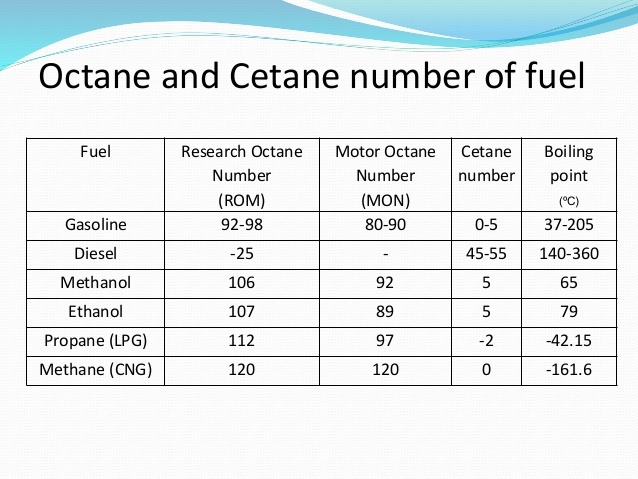 The Cetane percentage in the mixture gives the CN of the sample fuel. CN of the reference fuel cetane is arbitraryly set at 100, and of alphamethyl naptane at 0. CFR engine is used to measure the compression ratio at which ignition starts. CR is gradually increased while the engine is driven by an electric motor – a curve of CN vs critical CR is obtained. An easier and practical method to obtain Cetane Number is by calculating the Diesel Index. Increasing the DI, increases the tendency to ignite.